There is nothing like a Sydney summer filled with mangoes. Ripe and as cheap as they’ll ever be. Kids and adults alike appreciate the sweet juicy flavours and nutritional value. 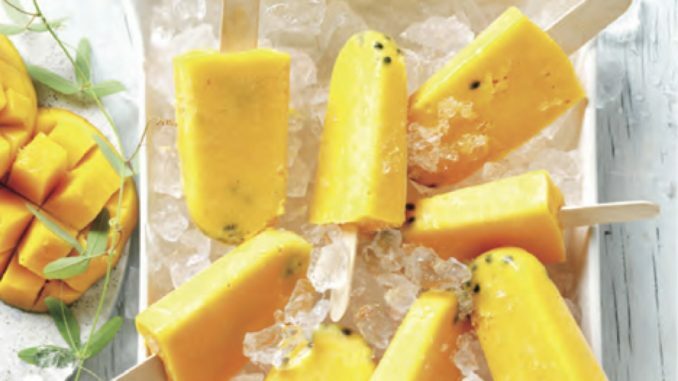 These cold healthy treats are the perfect end to a backyard barbie, swim or dance under the sprinkler. 1. Place the mango flesh and cream into a blender or food processor. Blend or process until smooth. Pour mixture into a jug and swirl through passionfruit pulp. 2. Pour mixture into 8 paddle-pop moulds (these can be bought from Ikea for about $5). Gently tap moulds to dislodge any air pockets. Insert a paddle-pop stick into each. Freeze for 5 hours or overnight until firm. Remove pops from moulds and serve.